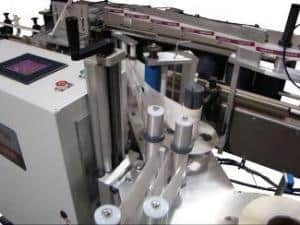 The labeler model 2000 NW is designed for packages as simple as a single wrap label on a round bottle and as complex as a front, back, and neck label application. All speeds are synchronized to a maximum of 2000 inches per minute. The 2000NW has many new and redesigned features. It has servo driven, twin feed-screws with an added feature that resets the “home” position that is so important for proper container control. The “homing” feature also allows for a quick change over from one package to another. The dancer arm has been redesigned to keep regular tension on the web to increase accuracy. It has a new and improved Pinch Grip mechanism. The state-of-the-art gap sensor includes a new “teach button” that actually teaches the machine to read the label gap automatically. This means that reading transparent labels is as easy as reading opaque ones. The model 2000NW is a production labeler designed for accuracy and dependability as well as competitive labeling speeds. It’s a new class of Pressure Sensitive Labelers! Designed for 1″ to 6″ diameter and 14″ tall containers, and label sizes from 1″ to 6″ tall and 14″ in length. Label can be moved up to 8″ from base of container. Accepts random bottle feeding or continuous production. Sensors control the infeed flow by starting and stopping the feedscrews. Microprocessor controlled with touch screen operator interface. Stepper driven conveyor, servo-driven applicators. Speeds to 300 bpm depending on label length. Web speeds up to 2000 ipm. Hot Stamp Coder for lot/date information. Wrap station permits labeling of round containers with a single wrap label or front and back application . 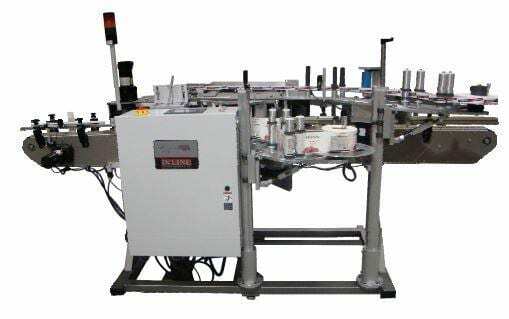 labeler 2000 NW labeler 2000 NR The Model 2000NR is designed to apply front and back labels to non-round and round bottles at speeds up to 300 bpm. 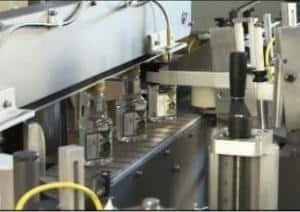 By adding our Wrap Station Assembly, the 2000NR can also apply single- wrap labels or front and back labels to round bottles. Conveyor speeds and label application are controlled through the use of state-of-the-art motion controls, stepper motors and servos. An operator controlled Touch Screen Interface insures ease of operation and convenience. With Feed Screw infeed as a standard, the precision of the label placement is incredible. 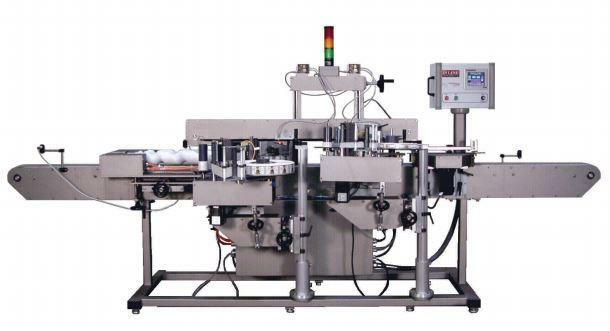 Servo driven Labeling Heads insure repeatability and accuracy of both the starting and stopping of the web. The Model 2000NR is equipped with our “Autoset” function which allows the machine to measure the label length, the bottle diameter and calculate the appropriate timings. Up to 100 settings can be stored as recipes and retrieved later. If you are looking for accuracy and dependability in a production labeler, this machine is for you! Designed for 1” to 6” diameter and 14” tall containers and labels sizes from 1” to 6” tall and 14” in length. Accepts industry standard 3” diameter core and 14” label roll size. Speeds up to 300 bpm depending on label length. Web speeds up to 2000 ipm. Wrap Station permits labeling of round containers with a single wrap label or front and back application.